This is not just any car. 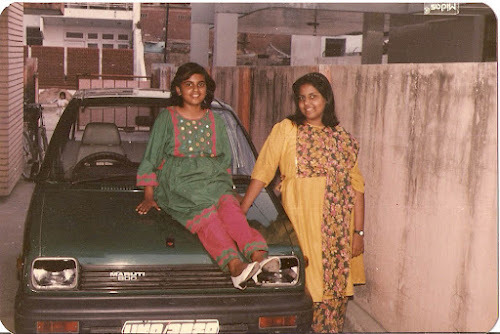 This is the car that was adorned with those "4 yellow flowers", by those two "street urchins"! Our 25-year-old Maruti 800... with my sister and me. We sold this car just 4 months ago. Yes, someone actually bought a 25-year-old Maruti 800... for the simple reason that it had traveled less than 38,000 kms in those 25 years! We bought it for 70 grand all those years ago. The exchange price offered to us by car dealers was just 5 grand. So I posted an ad for it on Quikr. Sold it within a week for 27 grand. This is my 15th post for NaBloPoMo March 2012. Link to the previous post: "Photo A Day: Clouds"
This machine deserves a longer post. Write one. How did u dig up this old post?